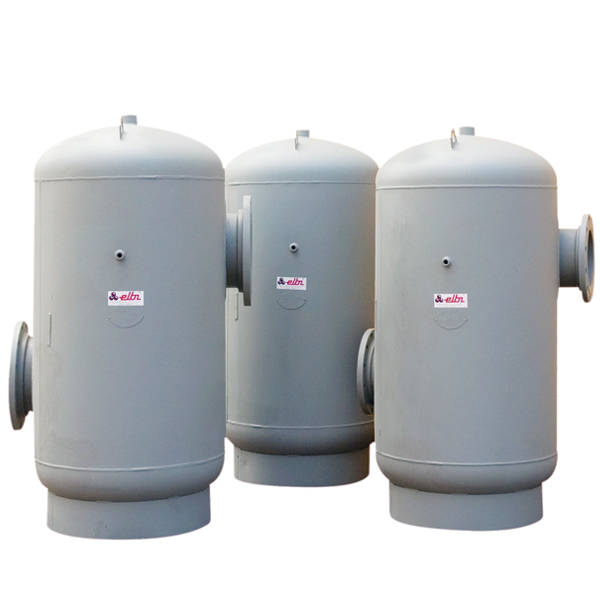 Our air separators are designed according to the latest ASME CODE Section VIII – Div. 1 using the latest technology in terms of manufacturing processes and quality control. Stock units are available in 125/150 psi maximum working pressure. Our standard stock line of tangential air separators are ASME vessels designed with tangential openings to create a low velocity vortex where entrained air is separated and removed from circulating water or anti-freeze in a closed system. Our ASW Series tangential air separators are supplied with a stainless steel strainer to collect unwanted system debris. Our tangential air separators are ideally suited to assist removal of trapped system air such as blocked terminal units, inefficient pump operation and performance, and costly corrosion and fouling of equipment. Ideal when used with our CIA-075 automatic high capacity air vent. ELBI air & dirt separators are utilized in hydronic systems to efficiently separate and eliminate debris and entrained air. This specialized separator utilizes coalescing media technology to remove air down to 18 microns in debris down to 35 microns. It has been 3rd party tested and found capable of removing 100% of the free air, 100% of the entrained air and up to 99.6% of the dissolved air in the system fluid during continuous circulation. The units we fabricate are designed to use a skim value to eliminate floating debris and an automatic air vent to disperse air. Also available is an optional, removable cover for maintenance of the coalescing media cartridge. ELBI Air & Dirt separators are utilized in hydronic systems to efficiently separate and eliminate debris in entrained air. This specialized separator utilizes coalescing media technology to remove air down to 18 microns and debris down to 35 microns. It has been 3rd party tested and found capable of removing 100% of the free air, 100% of the entrained air, and up to 99.6% of the dissolved air in the system fluid during continuous circulation. The units we fabricate are designed to use the skim valve to eliminate floating debris and an automatic air valve to disperse air. Also available is an optional, removable cover for maintenance of the coalescing media cartridge.